BUZZCAST: 50° this morning. A 10% chance of showers before 7am. Mostly cloudy today, then gradually becoming sunny, with a high of 67. N wind 16 mph, with gusts to 25 mph. Partly cloudy tonight, with a low of 43. N wind 12 mph, with gusts to 20 mph. HOLIDAYS: Happy High Five Day! It’s also Adult Autism Awareness Day, Get to Know Your Customers Day, Amateur Radio Day, Day for Monuments and Sites, Maundy Thursday, Ask An Atheist Day, D.A.R.E. Day, Lineman Appreciation Day, Velociraptor Awareness Day, Newspaper Columnists’ Day, Pet Owners Independence Day, Piñata Day & Support Teen Literature Day. Foodies enjoy Pizza Cake Day & Animal Crackers Day. Below is the latest single frame grab from the local radar. Hit refresh to update the radar. 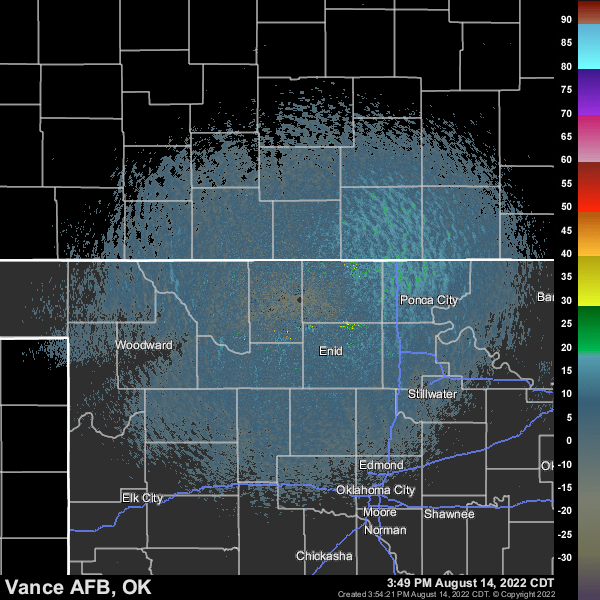 View the animated radar at Mesonet.org.